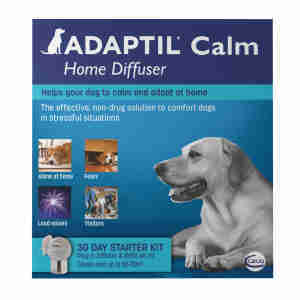 Adaptil Diffuser Plug In and Refill helps keep puppies and adult dogs calm in stressful and unfamiliar situations. Adaptil works by releasing a synthetic version of pheromones – the same scent that a mother dog sends out to reassure her puppies that they are safe. It creates a pleasant environment, easing your dog during stressful situations. The diffuser should be placed in the room where your pet spends the most time. The diffuser will cover an area of 50-70 sq m (one floor of a three bed property) and last for 4 weeks. The diffuser plug should be changed every 6 months. used by vets and pet owners worldwide for over 14 years. Stress is just as normal in dogs as it is humans. There are lots of things that could stress your dog out. Firework displays, being left at home alone, or traveling long distances could all upset your furry friend. Sometimes even little things could make them uncomfortable. If your dog’s sensitive to stress, then any little change could make them anxious. If your dog has started to hide from visitors (or even you and the family), or whimpers, shakes, or barks for no apparent reason, they could be suffering from stress. The diffuser can help to keep them happy and relaxed.